This is the third session in a series of panels co-hosted by the Brigham Research Institute and MassBio, during which panelists from renowned drug and device companies shared their knowledge on ways in which BWH investigators can obtain funding and in-kind support for their research. Frank S. David, MD, PhD, Innovation Strategist at the BRI, Founder and Managing Director of Pharmagellan moderated the event. 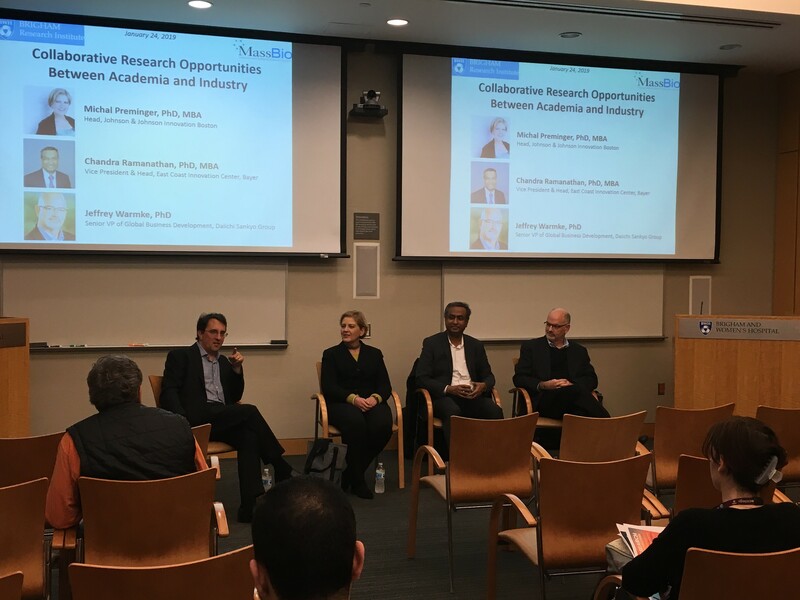 The three expert panelists included Michal Preminger, PhD, MBA, Head, Johnson & Johnson Innovation, Chandra Ramanathan, PhD, MBA, BP & Head, East Coast Innovation Bayer, and Jeffrey Warmke, Senior VP of Global Business Development, Daiichi Sankyo Group. After a brief introduction of the panelists, as well as those in the audience, Dr. David kick-started the discussion by asking the panelists to give a brief overview of the academic collaboration models in place at their respective companies and how they are different from their peers in the industry. The collaboration strategies described by the companies ran the gamut from the focus on niche areas with no-strings-attached grants at Bayer to a wide range of therapeutic domains and a focus on disease prevention across the early discovery to late stage development continuum at J&J. Irrespective of the approach used, the panelists all agreed that their ultimate goal is to find “good medicine” and help to move it forward through mutually productive collaborations with academia. They offered a few pro tips to the audience of investigators before the networking session commenced. First, if you would like to collaborate, anytime is the right time in terms of reaching out to prospective drug and device companies. Even if someone brings an idea forward that is too early or too incomplete, industry experts can still offer direction, suggestions, and valuable feedback. Second, you must keep knocking on the door. If you don’t push forward seemingly crazy ideas, then you are limiting yourself as well as the world of healthcare. Lastly, they opined that the makings of a good academic collaborator include strong communication skills, openness to sharing ideas and information, and the willingness to sustain long-term relationships. Events like these are an invaluable resource to our investigators across the hospital and we hope that you continue to attend!